There is a number of eCommerce platforms out there that offer shopping cart functionality with varying number of features and offered perks. Magento is one of the most popular of those platforms, in 2015 Magento has powered twice the amount of top 1000 internet retailers in the world than any other platform. 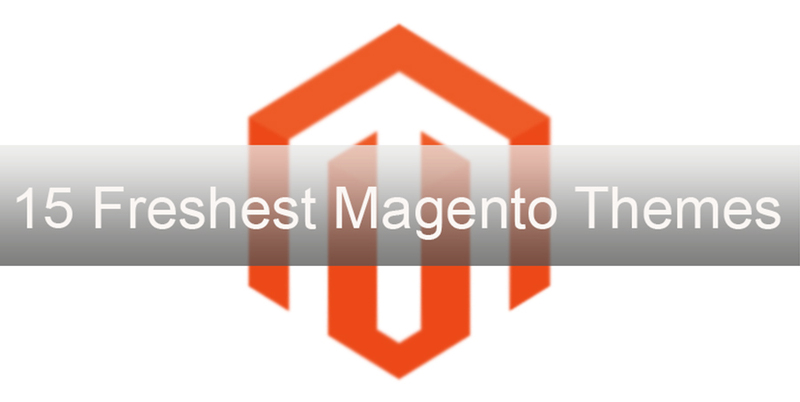 There is a number of key features that make Magento this popular, one of them is the template system it supports. Other features everyone loves include the great choice of useful modules to broaden the online store functionality, the ability to manage more than one storefront from one admin panel, support of numerous languages and currencies etc. Now, if you are a web designer and want your customers to receive the best online store designs from you – Magento themes are definitely a great choice to work with. Today I’m going to share with you 15 of the most recent additions to our extensive collection of professional Magento themes. Every theme I selected for this showcase has been added to the collection very recently, this ensures that every template here is perfectly in line with the latest trends in ecommerce design, fully responsive, up-to-date technology-wise and generally fresh. 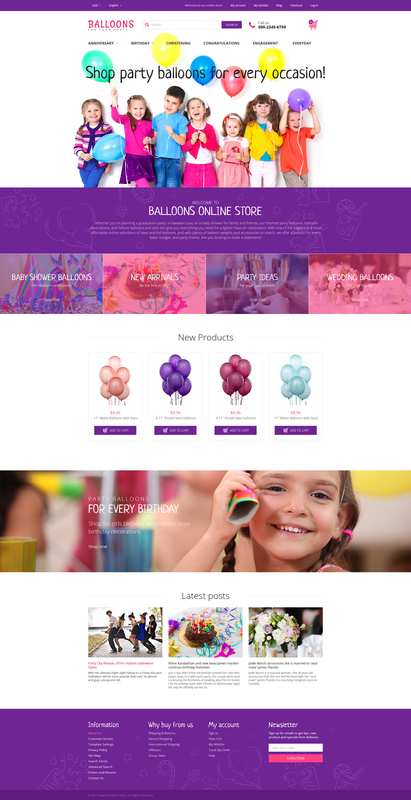 This responsive theme for Magento is designed in hand-drawn style which is just perfect for a kids store. 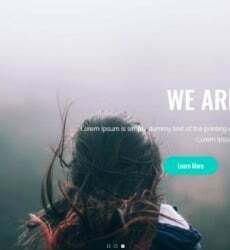 The theme is very clean and user-friendly. It comes with a number of web forms – contact form, login and user registration forms, newsletter subscription form and advanced search. Check out the live demo for more details! Newsletter subscription pop-up, very clean and minimalistic design, 4 supported languages, HTML plus JS animation, back to top button, drop-down cart, categories accordion, integrated Google map. These are just a few of the features this Magento template offers. If what you want to get in the end is a brightly colored modern online store with parallax scrolling effects and every single web form an online store needs – this entertainment Magento template is definitely a great choice! Fashion is highly competitive market today, so an apparel store has to be particularly flawless. The features this easy to customize Magento theme offers include every web form you might need, built-in Google map, tooltips and much more. 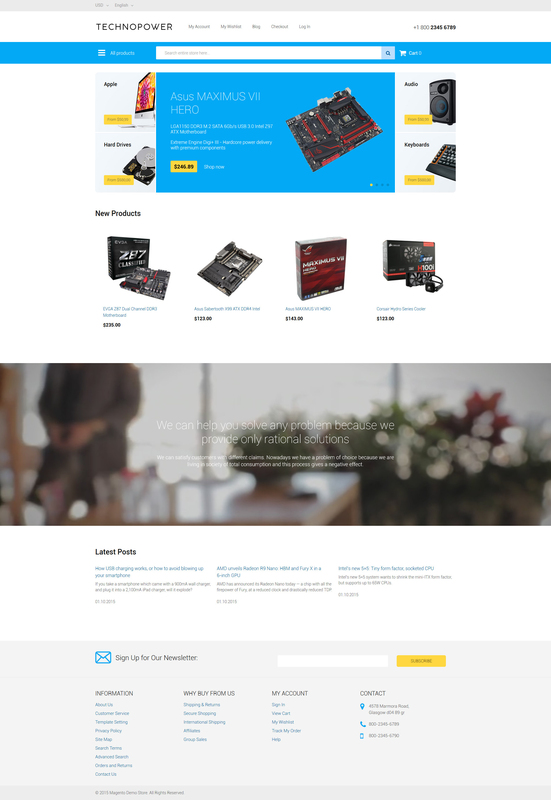 This computer store theme is a truly great design, it comes with background video and HTML plus JS animation. The clean layout is enhanced with boldly colored elements and drop-down menu. Overall – a great choice if you look for something modern and comprehensive. Done in warm colors and featuring full-width photo backgrounds, this wine store Magento design creates just the right atmosphere without losing any of its incredible functionality. The theme also features parallax scrolling effects and HTML plus JS animation, which make it even more fascinating. 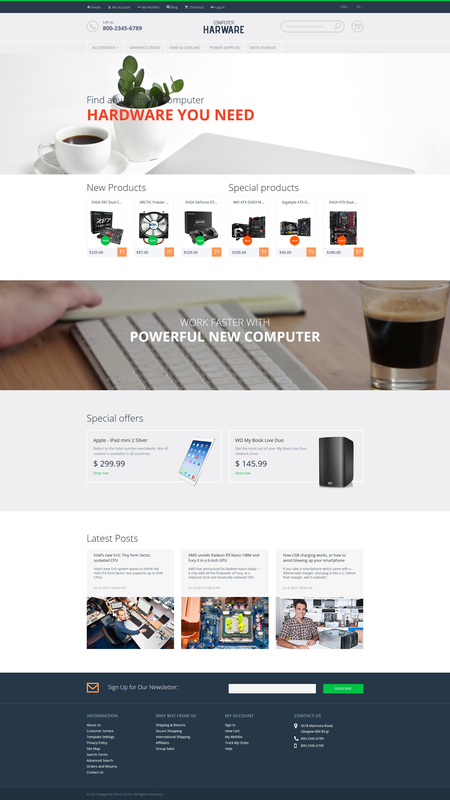 If you’ve been looking for a perfectly responsive Magento theme with parallax effects, hero header, fixed navigation bar with drop-down menu and every web form needed to run an online store – this design is definitely worth a closer look at. This responsive Magento layout features mega menu which makes it especially easy to navigate. There’s a social login option which adds to the user friendliness, a number of web forms which include contact form and newsletter subscription form. The theme is very easy to customize, just any other in this showcase. 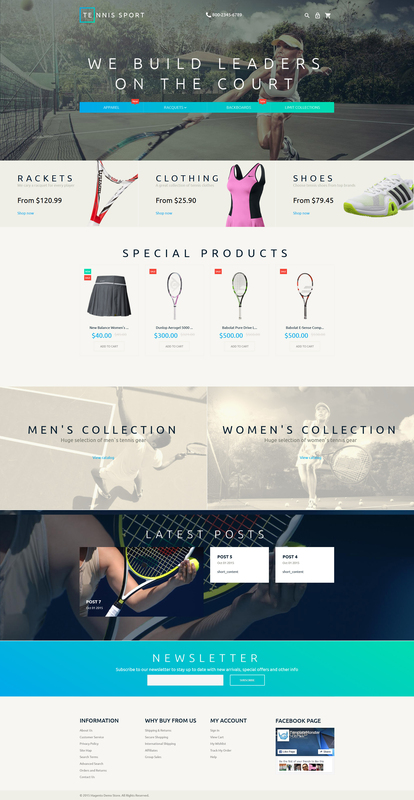 This exterior design Magento theme is just a perfect example of modern, clean and very stylish online store design. But it’s not just a beautiful design, it’s a fully functional shopping cart solution that is sure to create the most impeccable user experience. Studies show that pop-up functionality gets more popular with the ecommerce customers, this very crisp, very modern Magento design features just the thing – newsletter subscription form pop-up. Check out the live demo to see how it works! Want a clean and easy to customize Magento theme full of wonderful features? Check out this one! It comes with MegaMenu, newsletter subscription pop-up, video integration, parallax scrolling effects, tooltips, drop-down cart and much, much more. Hover-over effects and impressive hero header along with perfectly structured showcase for the products make this responsive Magento layout a truly great choice for any online store that needs modern design accompanied by flawless shopping cart functionality. You’ll be impressed with how easy it is to customize this magento design with its clean code and comprehensive documentation. The theme is responsive, cross-browser compatible and search engine friendly. The web forms provided and other functional features are guaranteed to create the best user experience. 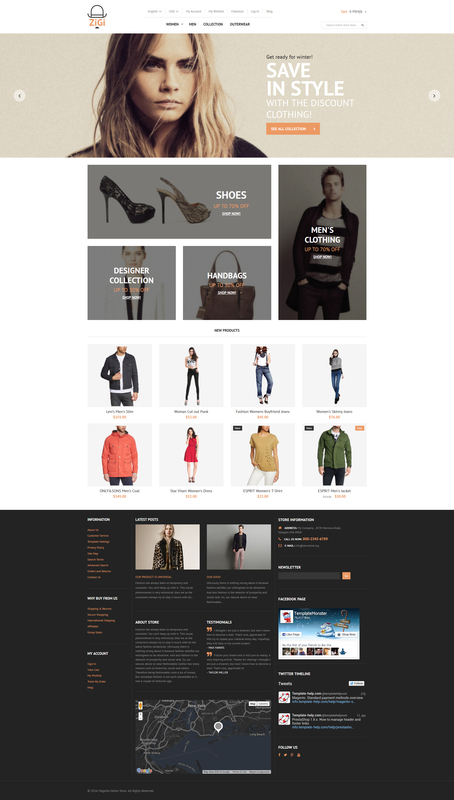 If you or your client want to compete with such retailing giants as ASOS and Urban Outfitters you need to consider this Fashion Magento theme for sure. The theme is easy to customize, you can change everything to your liking and to perfectly fit your brand. This professional Magento theme is exactly what a contemporary interior design business needs to establish a highly profitable online store. 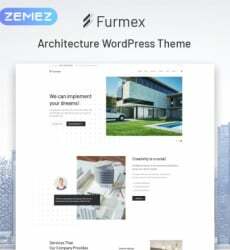 The theme features every web form one needs to run an online store smoothly, clean and valid code, custom design elements and so much more.